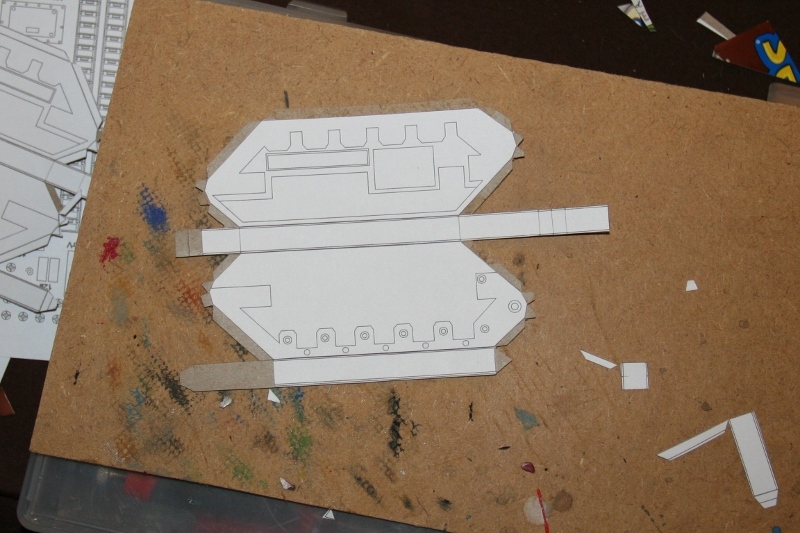 This is the second part in my series on how I scratch build the tanks that I am using for my Rebel Grots army. If you haven’t already you may want to read the first part on Gathering Materials, but it isn’t strictly necessary. 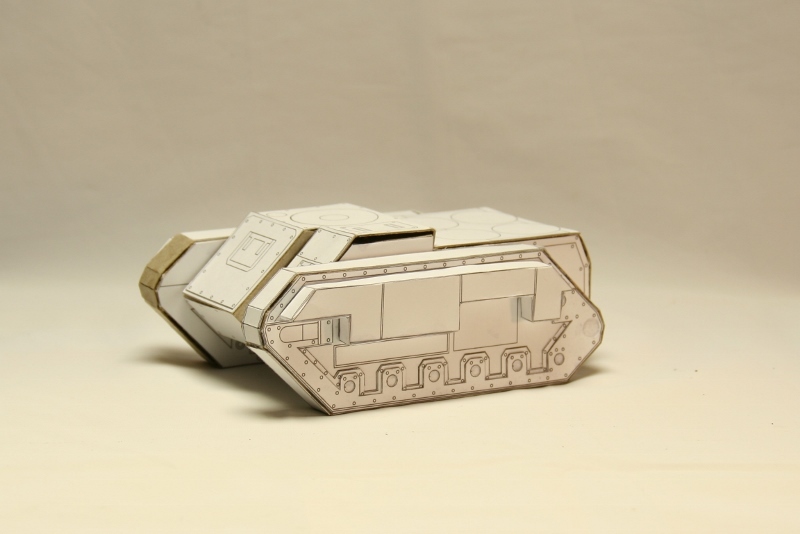 In this post I will explain how I turn cardboard and paper into a tank shaped box that’s reasonably recognizable. By the end of this we will have something that is good enough to use in your friendly practice games as long as your friends aren’t too picky. I start off with some high quality card stock salvaged from my recycling bin. I’m sure you could buy some fresh card stock for this purpose, but I’m not sure why you’d want to. 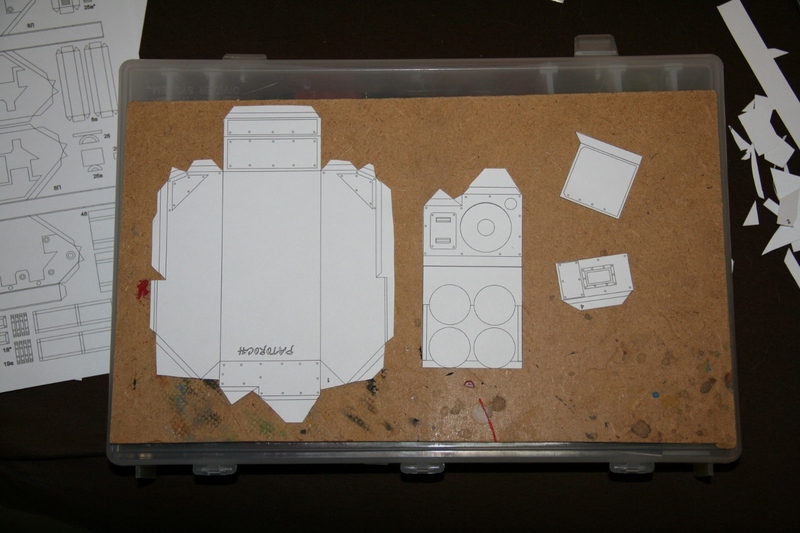 I’ve also printed my template, in this case a Hellhound template by Eli Patoroch,* on 110lb. index card stock. 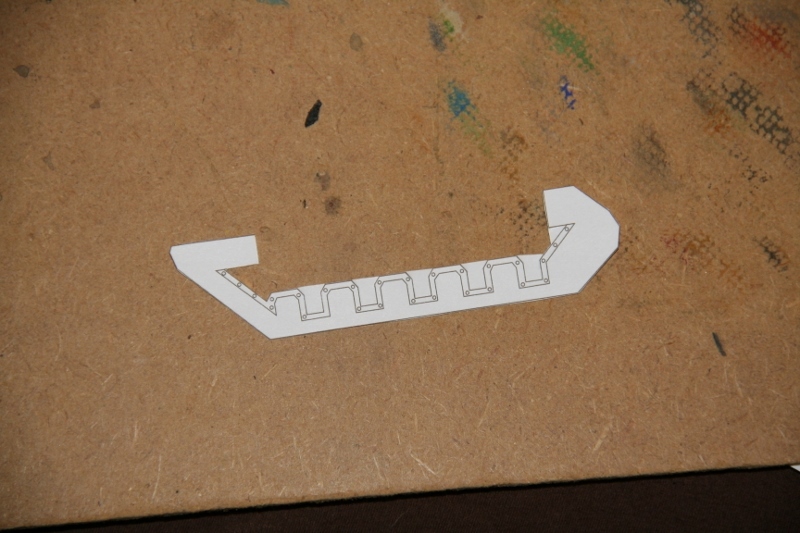 For those of you who’ve used a lot of plasticard, the 110lb stock is similar in thickness to .010 styrene sheet. 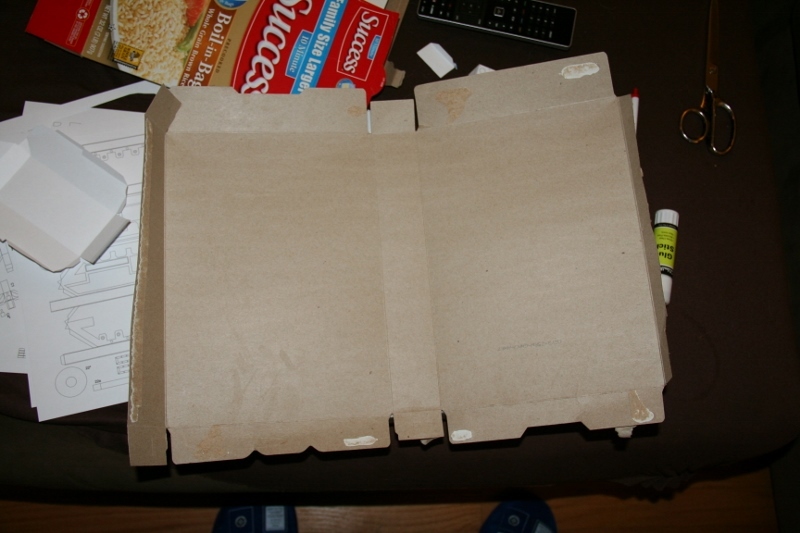 I cut out the pieces I want to use then glue them to the non-printed side of the cereal box using a glue stick. You can brush on a thin coat of PVA glue instead (I sometimes do), but I find the glue stick to be a little easier to work with. Then I carefully cut the pieces out using scissors. You can do this with a hobby knife, but I’m able to get it precise enough with the scissors. Where possible I’ve left the tabs longer than designed so I’ll have more surface to glue. Next I use a hobby knife to carefully score each line where it must be folded. If you don’t score first it is nearly impossible to get a sharp fold. I make sure to cut through the index card stock, and into the cereal card beneath, but am very careful not to cut all the way through. 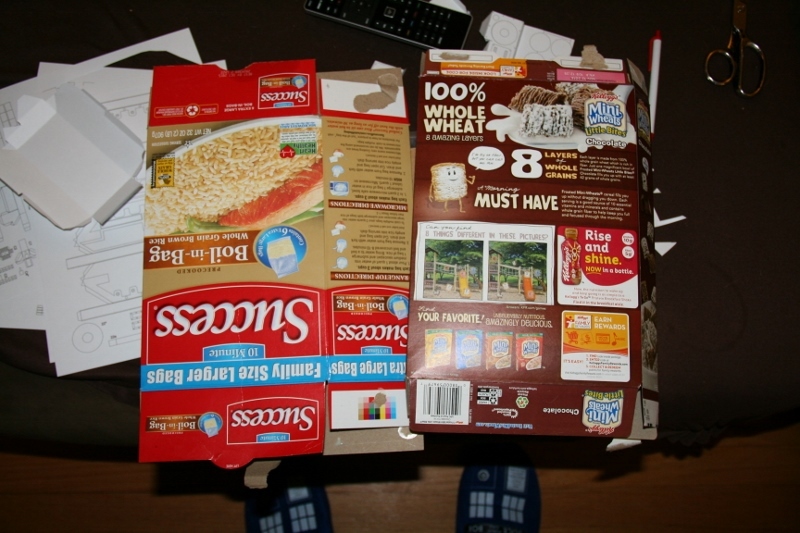 Sometimes the 110lb card will come off at the small tabs but for the most part I leave it glued to the cereal card. 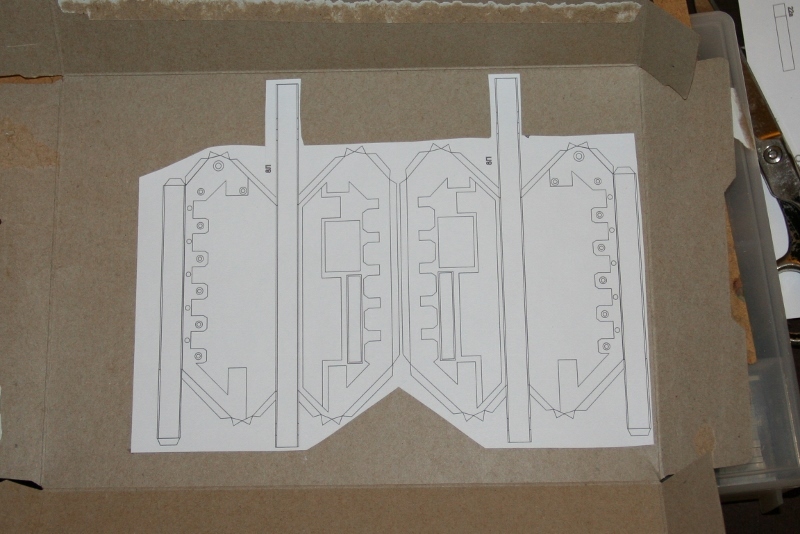 This adds a little weight and makes it much easier to see where other parts fit because the guidelines are all visible. You want to fold at the lines, not separate them! 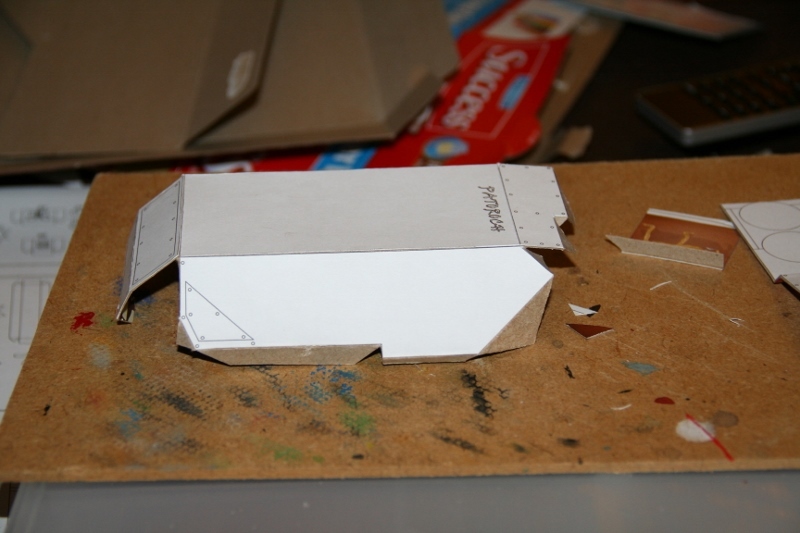 Once all of the fold lines have been scored, I carefully fold at each line to start forming the box. 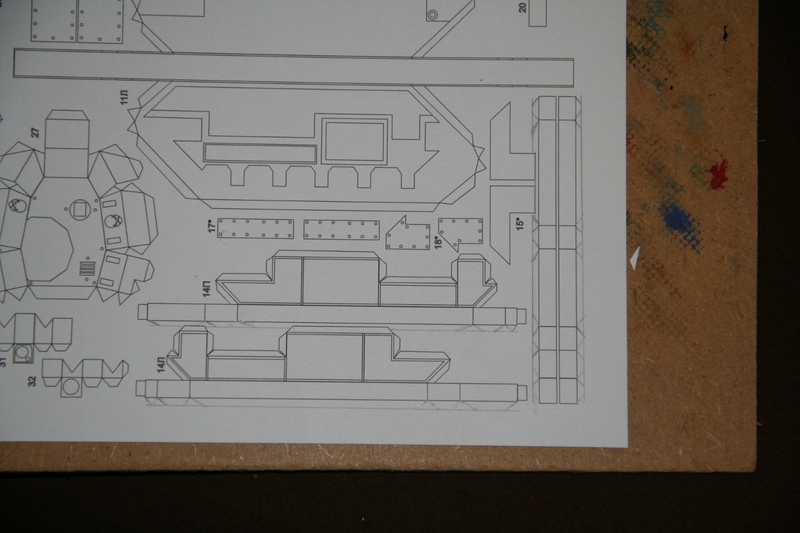 While doing this you can figure out where the tabs slip under other pieces. Next is the track housings along either side of the tank. 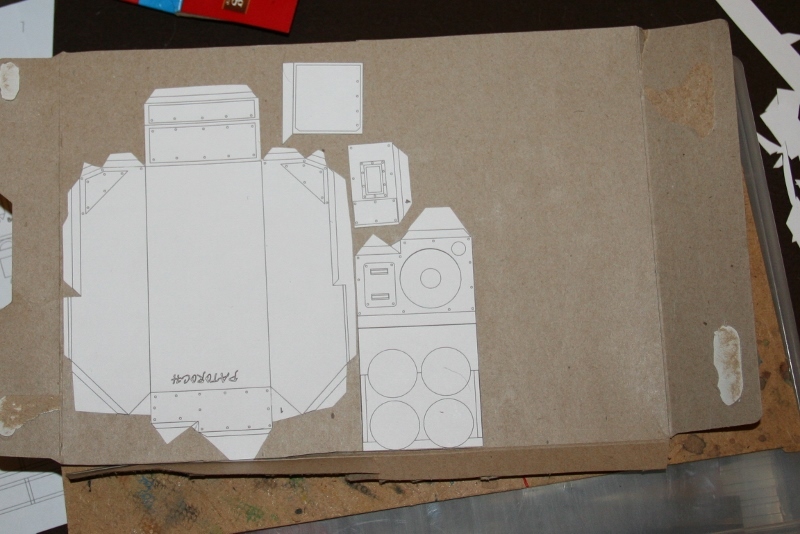 This is basically the same process: rough-cut the paper, glue it to the card, cut it out, score, fold, glue. In this one you can see how much extra I usually leave on the template when I glue it down. I don’t think there’s any point carefully cutting out each detail twice. Each of these forms a new box. I also neglected to get pictures of these. There are two detail layers that are glued to the tracks. I cut these out without gluing them to the cereal card. The 110lb card is thick enough to add some detail on its own. 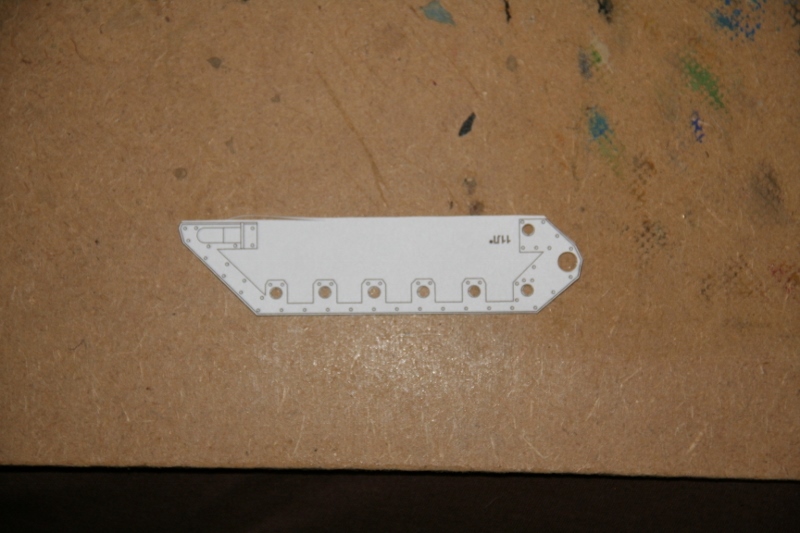 I use a 1/4″ and 1/8″ hole punch to punch out the holes in the second detail layer before I finish cutting it. It is flimsy and difficult to punch without tearing once it’s fully cut out. 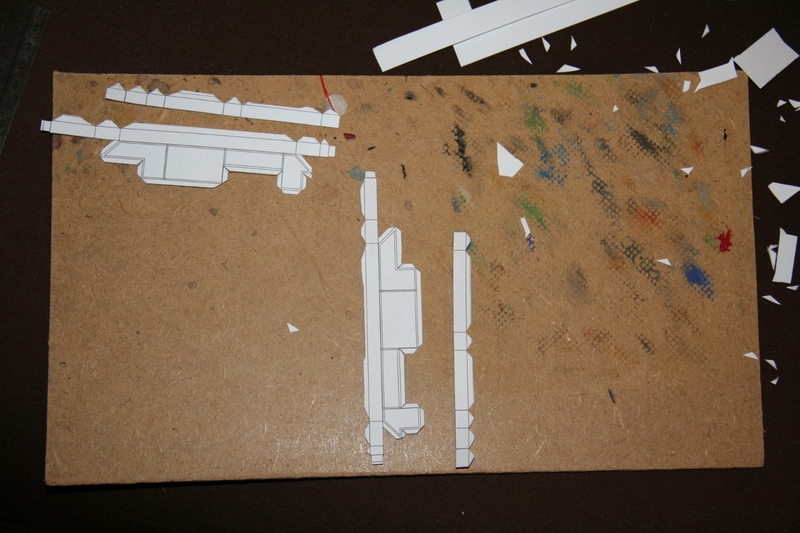 This picture shows the three boxes glued together, and the two detail layers glued onto the tracks. Next are smaller boxes that run along either side of the tank. I add extra tabs where these join to the tank because if you cut it out as is you end up trying to glue them on by the edges of the paper. Other than the extra tabs, it’s the same process of cut, score, glue. I did these with just the 110lb card so I was very careful to score the fold lines lightly without cutting through. The larger piece is folded and glued first, then the strip goes along the bottom to finish the box. I found it easiest to glue these together then glue them to the side of the tank before they dry. It’s easier to get everything square that way. Again, I’m using super glue for all of these joins. Once these are on you’ve got a tank shaped box with the same size and profile as the finished model, good enough for use in a friendly game. 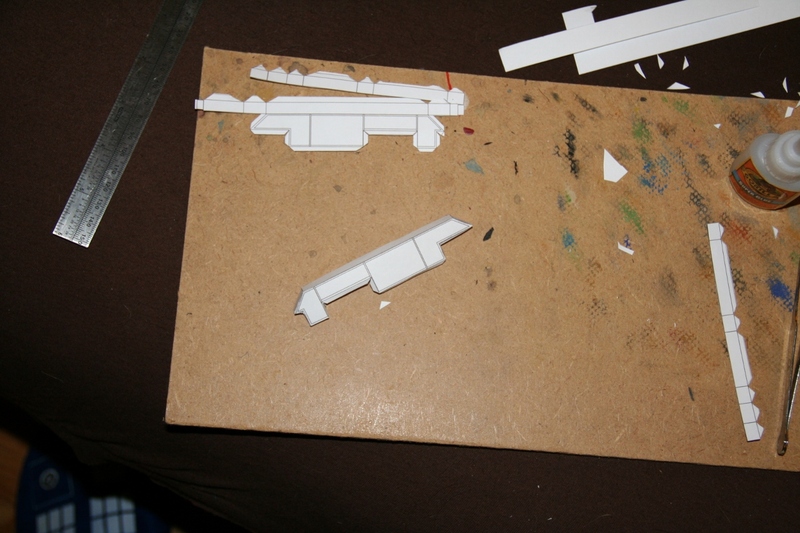 In the next installment we’ll start adding details with styrene card. I hope this has been helpful so far! Well done. I’ll have to check out the templates out there. I bet I can find something I’d use. Thanks. 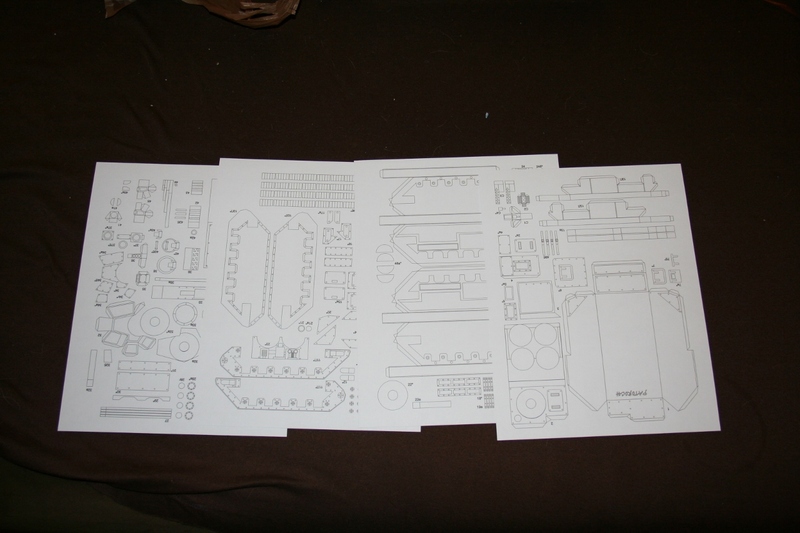 I’m sure you can find a template you can use there’s a staggering variety of tanks, walkers, and flyers available. Seems like a lot of work, but for people hobbying on a budget, this is a fantastic idea… also, plenty of options for modding. I bet you could even add some colour and texture in photoshop and either not paint it or have a guide to paint on. It is a fair amount of work but not too bad once you get the hang of it. The last picture represents about two hours of work while taking pictures and watching TV. The details can take a lot of time but that’s true with any conversion. I enjoy this type of work. If you don’t, I would definitely recommend the GW kits! You are right about the modding potential. The templates I’m using actually include a color and black and white pattern. I’m using the black and white because I plan to cover it in extra bits and paint it, but you could print them in color and skip the paint completely. I’ve also seen forum posts where people have re-colored templates to match their own army. 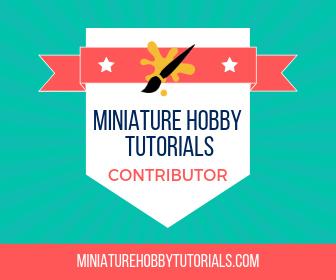 If you don’t enjoy painting, the time saved there might make up for the time spend cutting and gluing! I’m even thinking print them with texture and colour, then paint on top of it as a guide. That could work pretty well. It would be like priming with the perfect color for each section. You could get some very crisp iconography that way to. WOW. 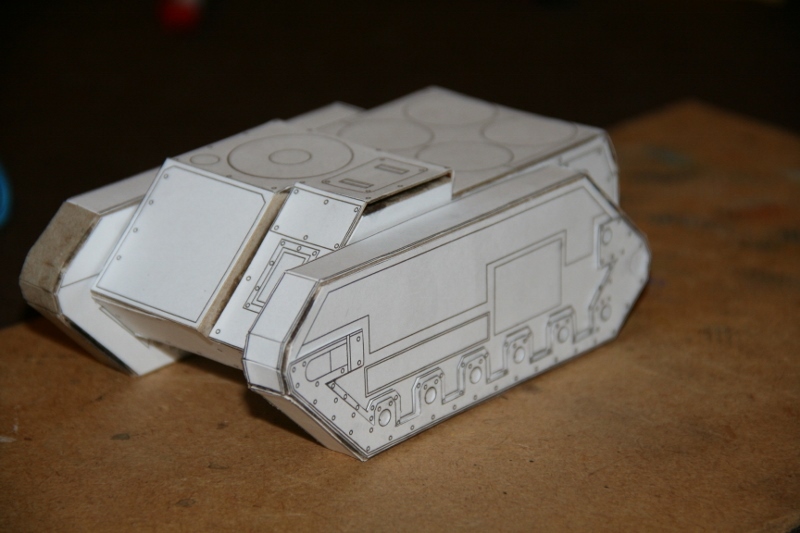 I have seen some impressive scratch-build tutorials, but this is really good in that you do it with stuff around the house for the most part and it looks the look, not like a box with a picture of a tank. Mind if I re-blog this? Thanks! You may re-blog this if you’d like. The more people who see it the better! Thanks, I’m glad you enjoyed it. Feel free to share. I am enjoying this series. It seems like fun to me. I used similar techniques to build those Necron Towers with Foamcore. Can’t wait to see more.